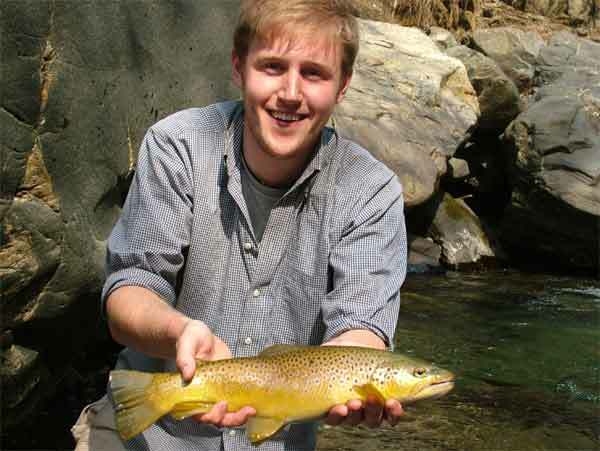 Our fishing waters include foothill dams, springfed or snowfed rivers and some icy trout waters. All waters have their own fish life. 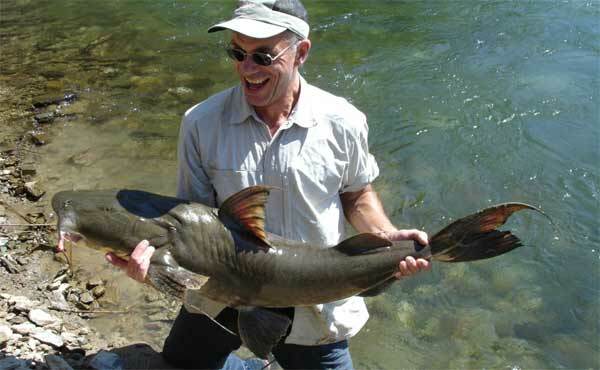 Mahseer fishing holidays, goonch expeditions, location services and more.. Depending upon the location and season, mahseer will keep all anglers happy whether they spinfish, flyfish or baitfish. While the Golden mahseer can be found in snowfed and springfed rivers, it is rare to encounter the Redfin outside springfed waters. The smaller ones are the most obliging and hit-happy but once you get through the brats, you can have a go at the big ones that lurk nearby. Specimen mahseer fishing is a matter of timing and planning. Spinning is the traditional way of mahseer fishing and gives good results but the best way of getting into numbers and sizes are to prebait a location and fish it intensively. 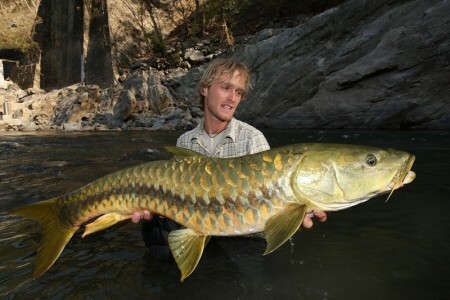 Best fish caught by the team was an 88lbs Golden mahseer from the Kali. 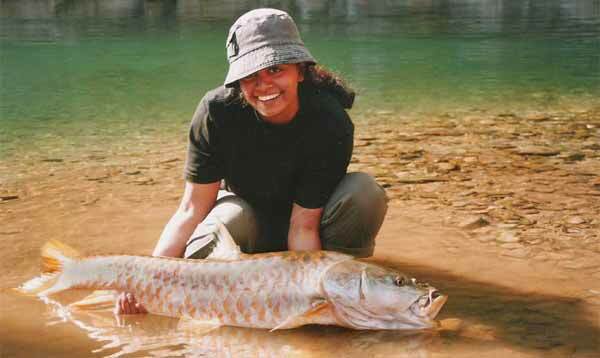 Book your Mahseer fishing holiday now! Would you like to beat this record? 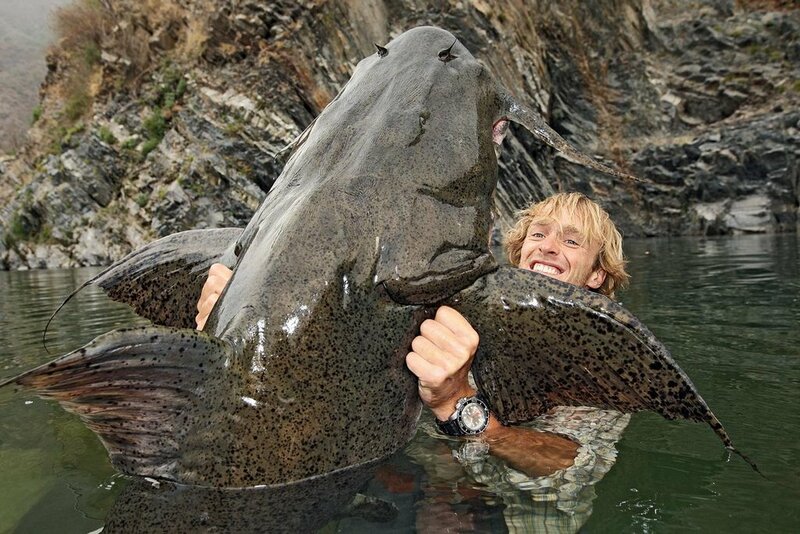 The Goonch is one of the last true megafishes left in the world. If you're looking for the heaviest catchable (?) 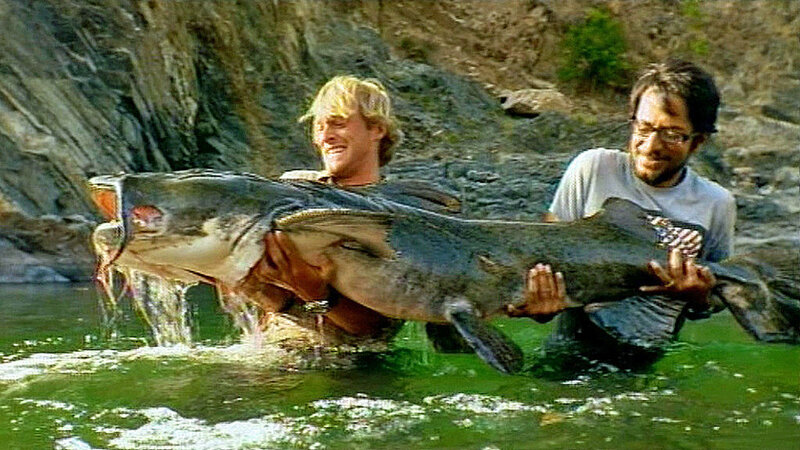 fish, the Goonch is as big as they go. Some specimens tip the scales at upto 300kilos. We've handled a 150kg specimen from the Ramganga, and can take you to places you can actually see these monster Goonch (fishing not allowed there). 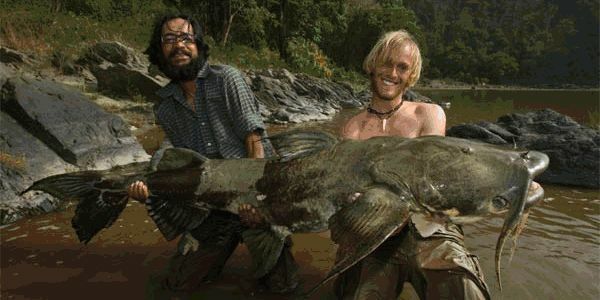 We got Jakub Vágner his 75kg IGFA record Goonch out of the Ramganga river. Catching one is reasonably tough, landing them is another story. For the sporting angler who likes landing big weights, the Goonch can be intensely gratifying or downright frustrating, especially if lost due to weak tackle. They can be extremely local and sometimes very specific in habitat, which is why fishing for Goonch requires time and our reliable guides. Ignorant anglers tend to kill goonch believing they'll cause less tackle loss and provide space for mahseer. We believe every fish in a river has a place of its own and helps maintain a natural balance. By the standards of removal prevalent these days, a good goonch is anything over 20kgs but there are locations which have been throwing up good 50+kg fish. We believe the new record goonch will come out of the Sarju and Kali rivers at the right time. Book your Goonch fishing holiday now! Trout fishing in India is a well kept secret. In Garhwal, trout were introduced in the early 1920's, at the behest of the Maharaja of Tehri who established one of the first hatcheries in this part of India. The fish were forgotten after Independence from the British in 1947. The hatchery expired in 1990 due to a severe earthquake, was rebuilt but not functional till this year. The browns have managed to make these waters their home. Trout in Uttaranchal are an as yet undiscovered quantity by most anglers, let alone the rest of the world. 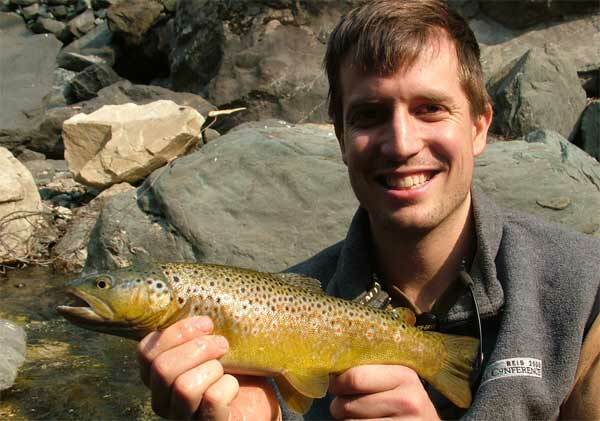 The fishing is good enough to justify long transit times to locations but once there, it is quite something to connect with trout under snowclad Himalayan peaks. Summers see some amazing hatches of flies and certain streams have much undergrowth leading to a great variety in insects. The local baitfish also curry favour with trout - one specimen of about 2lbs regurgitated a 6" torrent catfish. Another one threw up a 4" snow trout. Our best session on our favourite trout river gave us 98 browns in 2 days between two anglers. The other stream gave us 48 trout in three days of fishing, best fish 5lbs. Most fish were taken on flies, where flies didn't work, the shikari slung spinners to score. Book your Trout trip now! There are other fish to be caught too. 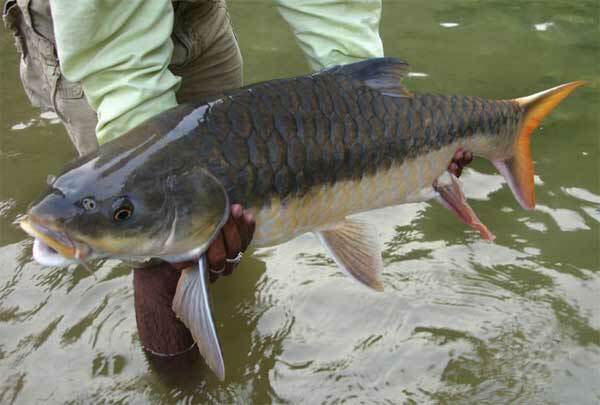 Our flatland reservoirs have the native carps like rohu catla, mrigal and lowland catfish like mulley (Wallago attu), Singhara or shovelhead (Aorichthys seenghala). Just let us know what you'd like to catch or where in our part of the hills you'd like to fish and we'll find the time for you.